Clients are empowered to solve problems with the other client. They create choices for mutual gain. They create solutions acceptable to both. A continuing relationship is important to both. Communication is guarded, secretive, deceptive and strategic. There is blaming and fault finding. The process is past focused – who did what to whom? The attitude is aggressive and defensive rather than assertive. The lawyers are responsible for solving problems and for solutions. The clients attack each other rather than the problems. They consider only choices which will advance their own position. They win big or lose big. 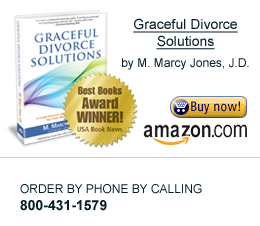 Have you experienced either a collaborative divorce or a litigated divorce? If so, do these ten points ring true for your experience? Thank you Marcy Jones for writing this book. You have said everything I always hope I remember to tell my clients when they are in for an initial consultation. Your words are easy to read and understand, and are a wonderful "take away" for clients as they begin their journey through the divorce process. Your words empower clients to understand that they do have a say in how their divorce goes. I use this book regularly as a gift to my clients, for their use, as they determine how they want to proceed.